This occurs 40 days after the birth of Jesus. 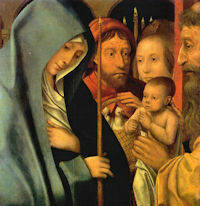 Jesus was presented in the temple and was prayed over by Simeon in the presence of Anna the prophetess. From whom did Jesus first learn how to pray?